A list of the various types of cement most commonly used in building construction. I get visitors from all around the world and it would be silly of me to try and give the various designations, numbers and the like that various countries and even manufacturers use to describe the various cement products. Having said that cements fall into the same general categories. It is a sad fact that some of the world's most beautiful and scenic areas are in the process of being devastated by limestone quarrying and the nearby factories that produce cement for construction work. I have seen the eyesores of cement factories as a lad in the Ribble valley of Lancashire and as an old fart I could't escape seeing them amidst the beautiful karst mountains in Southern Vietnam. Portland cement is not a trade name and neither does it refer to a geographical place of origin. It was first made in Britain in the early 19th century and it gained it's name from some products being made with it that looked like Portland Stone. An Expensive and desirable building material of the time. It is the most common form of cement used world wide and it dries to a light grey colour. It is durable an versatile and it is forgiving of sloppy construction practises. The main ingredient of Porland cement is Limestone which is an abundant rock that is mined and quarried around the world. There is currently a push from the European nations towards these types of cement that use a lower proportion of clinker in the manufacturing process. They are said d to be greener and to leave a smaller carbon footprint. I once did a job renovating a building that suffered from catastrophic concrete cancer. 20mm rebars were literally rusting and cracking and lifting out of floor slabs so badly that you could trip over them. The reason was that it was in a salt water environment. Similarly I have done repair work in sewerage pumping stations that were affected by the chlorine that was used in them. The answer was to use a sulphate resisting cement type that contains a high content of iron oxide. Other types contain a proportion of fly ash in their make up. A cement type that is capable of setting and hardening under water. Calcium-aluminate cement, suitable for use at high temperatures. Used in kilns, furnaces and the like. Rapid setting cements are composed of standard Portland cement that is generally ground finer. They may also contain materials such as calcium aluminate or calcium sulfoaluminate. Because they gain heat quickly they are used in some cases where cold weather is a factor, but for the most part they are used in precasting factories where a fast turn around of moulds or formwork is needed. A finely ground high density anhydrous plaster mix. Made mostly from calcined or dead-burned gypsum. This is a type of Portland cement made from usually pure chalk and white clay (kaolin). It also may contain some iron oxides and manganese oxides. It is dearer than standard grey cement. White cement is used for decorative work or decorative toppings like terrazzo. It also makes for brighter colours when ochres and dyes are used. Some manufacturers also do varying grades between the standard grey and the white but they can hardly be said to be different cement types. 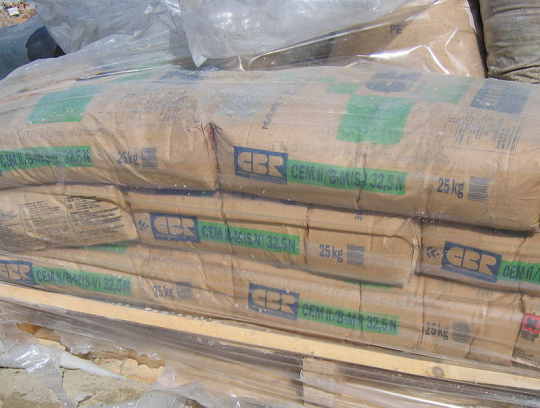 I do not know the proportion of bagged cement sold to bulk cement sales, but it is a huge amount of each. Bulk cement is transported from the cement plants by tanker trucks to concrete batching plants and other bulk users. Other users like brickies and plasterers buy it in bags. These bags at 25kg are not used in Australia any more, out work health regs mandate 20kg maximum.